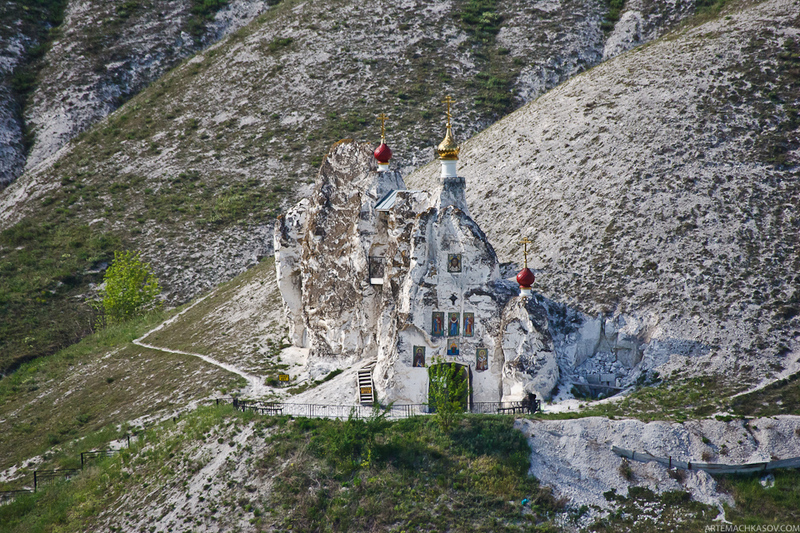 The Holy Savior’s Convent is carved into the very rock of chalky and sparse mountains, three hours away from the Russian city of Voronezh, on the banks of Don River. Over the many centuries, it has become one with the landscape, the quiet glory of the rocky hills. Two legends have been passed down about how it was founded. According to one, it was founded in the 1600s by Cossacks (Slavic warriors of the steppe) running from persecution in Ukraine for refusing to accept the enforced Union of 1596 with the Catholic Church. The original legend though, is that the cave monastery was first founded by Christians refugees of the brutal iconoclast persecution of the 700s in the Byzantine Empire. If so, the Kostomarov Savior Monastery was one of the first, secret, Christian hubs in the kingdom, proselytizing the word of Christ in a still pagan country until the official Christian Baptism of Russia in 988. Either way, it is obvious that this remote place offered the perfect hideout for religious ascetics when the world persecuted them. Monks-hermits cut out tiny cells for themselves in the chalk rock, where they led a reclusive life, praying and hiding from ill-wishers. Their only contact with the outside world was through little windows cut into the rock face. They communicated with pilgrims and other monks through them, taking food and notes with prayer requests. Around the 12 century, the first visible monastery structure was built. The purpose was to provide the faithful with a hideout during raids and attacks. The Savior Church, the main church of the monastery, is a sprawling underground space that holds up to 2000 (!) people. Its arches rest are held up by 12 huge chalk columns. The monastery went through three major periods of construction in the 6th-7th, 8th-9th and 12th centuries. 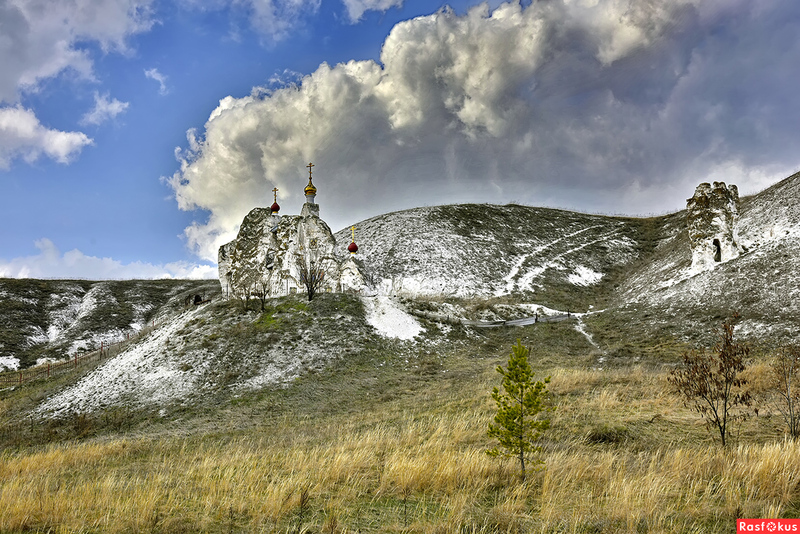 All throughout the Russian Empire, people knew about this monastery’s Cave of Repentance. 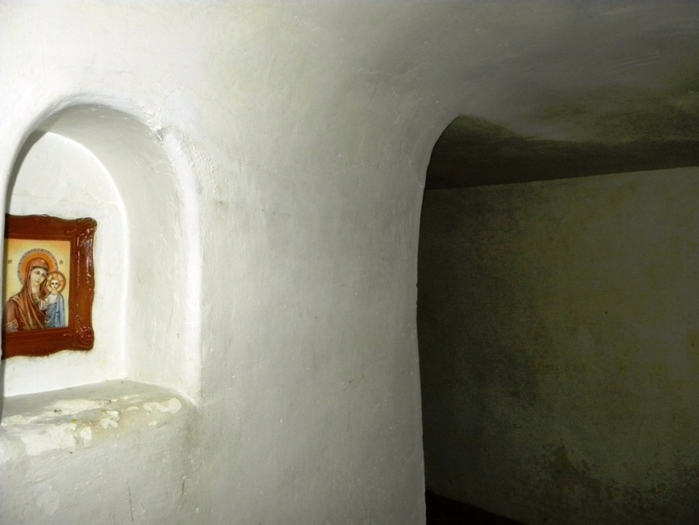 It was in this cave that the Sacrament of Confession was performed for all the monastery’s inhabitants and pilgrims. 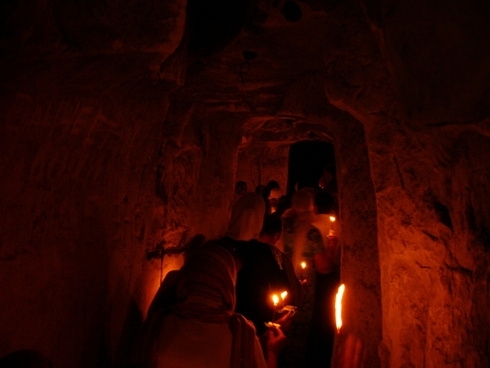 The narrow vaults of the Repentance Cave, the low ceilings and a long cave corridor, where, in niches, nestled icons, and candles were burning, helped the pilgrim walk the way of repentance and reach the place of confession, having subdued pride and left all earthly thing behind. With each step the ceiling becomes lower. By the time he reached the elder in the tiny Cave of Repentance, the sinner was crouched into a deep, low bow. Before the Revolution, the Savior monastery was where Russians sent to the confession the most desperate sinners. After the Russian Revolution in 1917, the hermitage was closed and monks executed. But the pilgrims, secretly, kept coming. In the 1940s, under Joseph Stalin, the monastery reopened and reconstructed. 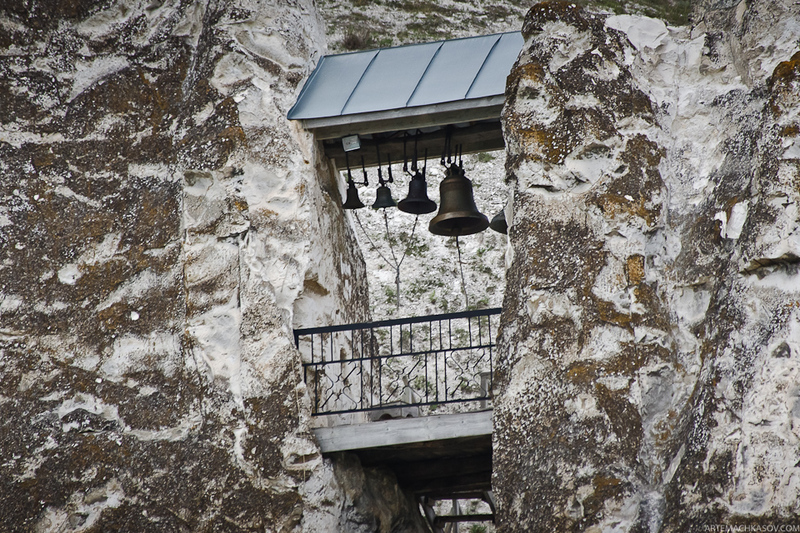 During WWII, the caves of Holy Savior Monastery provided shelter for the Russian soldiers and locals from the Germans. But in 1960, at the direction of the then-president, Nikita Khrushchev, the monastery was shuttered yet again. All the external buildings were burned and the cave flooded. Only after the fall of the Soviet Union, in 1993, the reconstruction of the monastery began. Modern churches and buildings were built, and the famous old cave Savior Church reconstructed, and the monastery reopened, this time as a female convent. By 1997, the cave complex had living quarters, nursing corps, refectory and a chapel. Immediately, pilgrims began flooding in. Today, this remote place is visited by people from all over Russia and the world. Modern visitors express confusion as to what the 'Cave of Repentance' really is; nuns sometimes offhandedly refer to the whole monastery, or the main church, or the tiny confession cave, as the Cave of Repentance... The concept of the cave has engraved itself so integrally into the identity of the monastery, that it penetrates the entire monastery, its heartbeat. It's not just for the wild beauty of the place that has people of so many different molds and times, magnetically returning to this place. It's for the deep sense of prayer and struggles that the rocks have soaked in over the centuries; for the repentance that, it seems, is more profound here, than anywhere else in the Russian lands.